The Bosch GLM80 Laser Rangefinder is an advanced tool used to measure distance and make calculations. Laser distance meters enable professionals to determine accurate measurements of hard-to-reach areas, avoiding hazardous zones and the need for another person. You simply aim the laser beam at a target point and with the push of a button, the value is instantly displayed on the 4-line LCD screen. 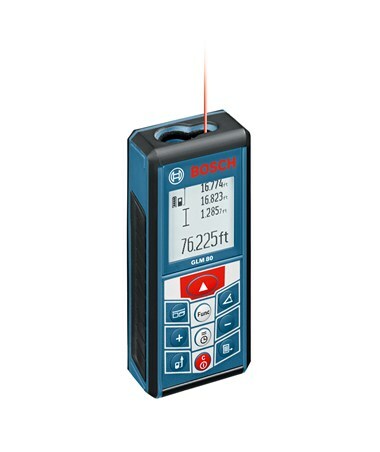 The Bosch GLM80 has an array of added features and measuring modes, including a rotating display and integrated double axis tilt sensor, making it an ideal choice for a portable rangefinder. As a very versatile handheld distance laser, the Bosch GLM80 can be used both indoors and outdoors. With a measuring range up to 262 feet and accurate results within ±1/16 inch, this distance meter is both functional and reliable. Particularly useful in angle and inclination measurements, the Bosch GLM80 is the first in its industry to integrate a two-axis 360° tilt sensor. This means that angles can be measured with extreme accuracy whether the unit is pointing horizontally or vertically. The device is also meant for use in all lighting situations, as it features a large display with automatic illumination that can be turned off if desired. It is also the only laser measurer with tilt screen technology, where the screen rotates automatically according to its position, so results can be read clearly either horizontally or vertically. The device has internal memory that stores the last 20 measured values and one additional result that can be permanently saved as a constant. 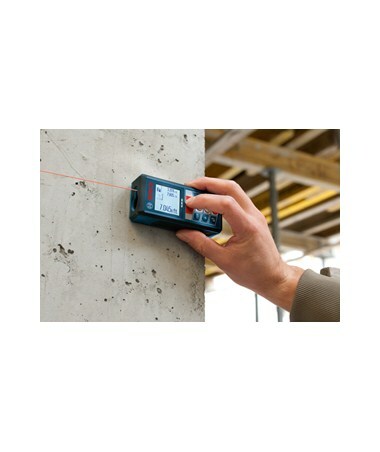 Also new to the industry, the Bosch GLM80 is the first laser measuring tool that is powered by a lithium-ion battery! The package includes the battery as well as a charger, but the battery can also be charged through a standard micro USB port. On just one charge, the GLM80 laser rangefinder can take up to 25,000 measurements, and there is a battery level indicator on the LCD screen that flashes when a charge is needed. In addition to its innovative features, the Bosch GLM80 also exhibits many useful functions and measuring modes. Addition, subtraction, area and volume calculations are quick and simple. Continuous distance measuring is possible and min/max mode determines the shortest or longest distance from a fixed reference point. The multi-surface area function is useful in calculating the total area of individual surfaces with a shared length or height. For spaces that are inaccessible due to obstructions, the indirect length mode is used. 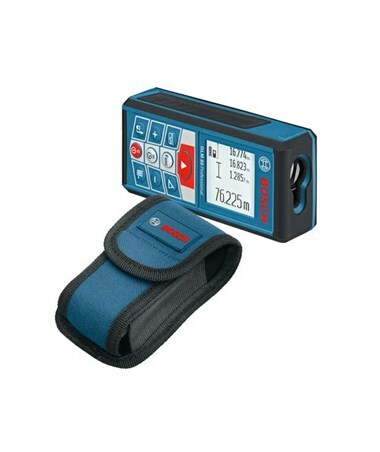 The device can also be screwed onto a tripod via the built-in ¼-20 inch thread for extra sturdiness during measurement. 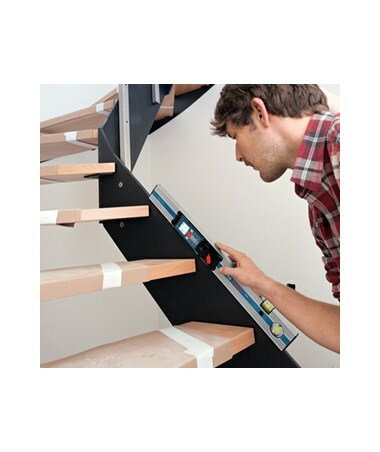 When measuring from corners or edges, the flip-out extension pin is very useful to ensure accurate results. While serving as a highly efficient and functional digital measuring tool, the Bosch GLM80 is also extremely durable and portable. It is lined with rubber protection on its sides to prevent potential damage and is guarded from drops up to 3 feet high. Its IP54 rating means it is a certified dust- and water-resistant product, so it can be used in various weather conditions. Even considering the GLM80’s resilience, the laser measuring device is still very lightweight and compact enough to fit in your pocket. For added versatility, the Bosch GLM80 laser measurer can also be used in conjunction with the R60 digital level attachment (not included). The unit is simply placed inside the measuring rail, essentially transforming the GLM80 into a digital level. The R60 automatically recognizes the GLM80 and the pair enables more accurate grade measurement. The Bosch R60 Measuring Rail is available together with the GLM80 rangefinder from the pull-down menu on the upper right-hand side of the screen. 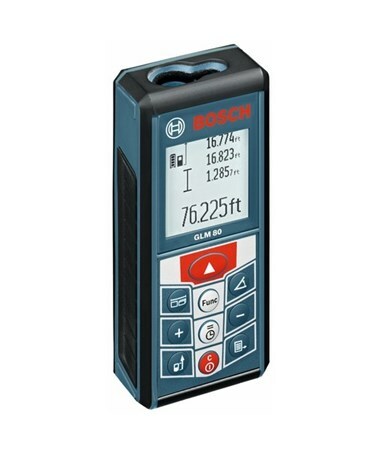 With the exclusive features the Bosch GLM80 introduces to the industry together with its practical settings, this handheld distance meter is a must-have. Contractors, painters, builders, and others will enjoy the newfound simplicity in measuring and calculating all types of spaces with precision. For your guaranteed satisfaction, the Bosch GLM80 is backed by a 2-year manufacturer’s warranty.